First off, let me point out that by the term "fantasy" I tend to look at the genre as more of the old-fashioned (by today's standards) sword and swashbuckling. Big swords, big monsters, that kind of thing. It's not necessarily my preference, but it's how I usually think of the fantasy genre. I tell you all this so you will know my influences for my choices of YouTube channels below. Secondly, with a few exceptions most of these channels do not focus specifically upon the fantasy or speculative genres, and they're not even channels by writers. The majority of YouTube channels below are, I believe, informative, often entertaining and well worth the time of any fantasy writer. Also, this list is not meant to be exhaustive, but is merely made of channels I personally have found useful and interesting. The videos shown are only a sampling, and should not be considered representative of everything available at the individual channel. The host here is Matt Easton, who has more than a dozen years experience teaching Historical European Martial Arts (HEMA). Of all the YouTube channels pertaining to European sword fighting, I personally feel this one is the most knowledgeable. Even if you think you know your stuff when it comes to swords, I bet you will find some surprises here and learn a few things. Also, swords aren't the only subject matter here, as Matt gets into other period weapons. I might be a bit biased when it comes to Skall's channel because I mailed him (and his girlfriend, Cara) a package a while back and it was featured on the channel. Still, I think this is one of the best sites for learning about European historical swordsmanship, other historical weapons, armor, etc. Though not as experienced as someone like Matt Easton (Skall often calls himself a beginner), there is still much to pick up here. For one thing, most viewers also are likely to be beginners, or only armchair swordsmen (waving my hand here), and it can help them to study the basics along with another beginner. But swords and training aren't all that appear on this channel. If you are interested, Skall sometimes has a firearms video or a more philosophical video or even a fun, entertaining video featuring a bit of role playing. Of all the channels mentioned here, this one is the most entertaining and the most funny, at least in my opinion. Lindybeige himself has some experience concerning European historical arms, and most of his videos make specific points about weaponry and the like while bringing out some humor. Occasionally he will include a travel video or simply an entertaining video, and sometimes he will dissect historical or fantasy movies or movie scenes, all with some chuckles. At first glance, this channel looks like it's run by a couple of good-ole-boys who like to stab things in their back yard. Then you find out they're in Texas, so they really are a couple of good-ole-boys who like to stab things in their back yard. And when I say "things," I don't mean they're serial killers knocking off their latest victims for the world to see, but that they are testing historical weapons against the likes of cardboard boxes, wooden targets, dummies, etc. One of the nice things about this channel is you get to see historical weapons, mostly sharp, pointy things, used in a practical format. You get to see the weapons used properly, and you get to watch of what the weapons are capable. Also, the two guys behind this channel, Thrand and Eldgrimr, do a good job of debunking some of the nonsense you might find on "historical" television and movies and the like. And they are more than willing to work through any debates or conversations concerning the different uses of arms historically, all from a practical viewpoint. Fans of historical Vikings should be more than pleased with this channel. Nerdarchy: This channel focuses upon tabletop role playing games, usually Dungeons and Dragons, but quite often the information discussed can be of interest to fantasy fiction writers. The regular crew here are Ryan, Ted, Dave and Nate, but friends of theirs show up from time to time, as well. There are videos here of actual gameplay, so you can learn about tabletop RPGs if you're not in the know, but this channel tends to focus upon group conversations about aspects of the game, many of which can also be related to writing. Storytelling, character arcs, world building and more are common topics of conversation. As the gang often says, "for nerds, by nerds." hickok45: Perhaps a little less useful to the fantasy writer, this channel focuses upon firearms of all sorts from history up to modern day. The emphasis is upon modern and semi-modern firearms, but occasionally there is a video about black powder weapons and the like. Still, to some extent or other the information here should be of interest and worth study for most fiction writers. Besides, the host, hickok45 (and sometimes his son, John), is pretty entertaining and offers plenty of hands-on knowledge and experience. Notes: I'm well aware of the importance of this book and its series to modern fantasy, second only to Tolkien's works in popularity. I've been putting off this series because I wanted it to be finished, but that doesn't seem to be happening any time soon, so here we are. I did watch a few episodes of the TV show, so I am familiar with some of the characters and events, but to be honest I don't remember a whole lot and maybe it won't be ruined for me. Mini review: It's a good book, with some of the clearest and cleanest prose I've found in a modern novel. Still, I'm not sure it deserves all the attention it's received. Maybe my thoughts here are biased because I had seen some of the TV episodes. Either way, though never bored, I also never felt overly excited reading this novel. I also rarely felt attachment to the characters, though a couple came close (Arya and Tyrion, for those interested). Concerning modern fantasy authors, I believe I prefer Brent Weeks for action writing and intrigue, and I prefer Steven Erikson for epic story and much more. 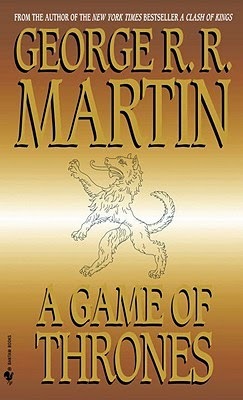 All of this isn't to say Martin is not a good writer, because he most definitely is, but I didn't find this to be the great big be-all, end-all of fantasy literature that so many seem to think it is. Will I read further? Maybe, but probably not, at least not until the series is completed, which doesn't appear to be anytime soon. 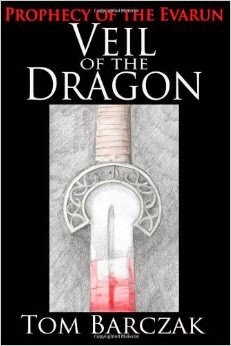 Notes: This fantasy e-book caught my attention because of its cover. Simple, somewhat dark, elegant. I like fantasy covers like that. In fact, I tend to prefer them over the ones that have lots of extravagant artwork. Just my preference, though. This is my first time to read this author, so now I'll see if his prose matches his cover. Mini review: Great story, intriguing characters, interesting background, solid prose (though perhaps too flowery in places), but a couple of downfalls for me. First, practically nothing happens in the first half of this novel; after a smart beginning, two characters walk through some woods while occasionally having chats with strange figures. Second, and more importantly for me, there is such a mix here of visions and dreams and prophecies that more than a few times it is impossible to tell what is happening. Related to this, character deaths mean practically nothing here because of all these visions and prophecies; the reader can never trust for sure if a character is actually dead or has had some kind of metaphorical death and will pop back up in a few pages. Still, there's a lot here that's quite good, and the setting definitely lends itself to further tales.